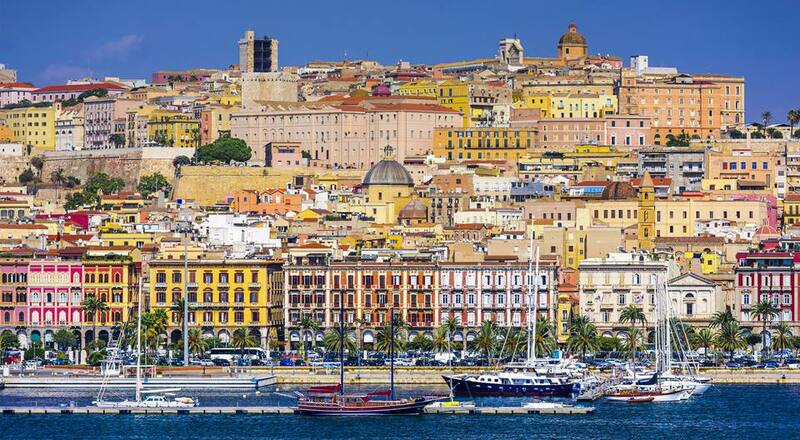 Cagliari is the largest city on the Italian island of Sardinia. It has both a large port and an airport, making it easily accessible from mainland Italy and a good place to start a tour of Sardinia. The city also has many interesting sights and attractions, from archaeological treasures to medieval monuments. Cagliari is on the southern coast of Sardinia, or Sardegna, a large island in the Mediterranean, west of mainland Italy and just south of Corsica. The castello or castle district is the oldest and highest part of the city and a good place to wander around. The roof of Bastione di Saint Remy is an open terrace where you can enjoy great views of the city and sea beyond or have a drink at one of the bars. Inside is an exhibit area and concerts are sometimes held here, too. In the Castello district are the Romanesque Cathedral of Santa Maria and museum, the Archbishop's Palace, and the Elephant and San Pancrazio Towers. The excellent Archaeological Museum has exhibits tracing Sardinia's history from the Neolithic age, through the Phoenicians and Romans, and on to early Christian and the Middle Ages. It's in the Citadella dei Musei, a museum complex in the former arsenal where you'll also find the National Art Museum and a museum of Oriental Art. The Marina district, near the port, has an arcaded street with cafes and shops, the town hall, and several churches. Don't miss the excavations beneath under the Church of Sant'Eulalia, Vico del Collegio n.2, where you can see a Roman paved road, remains of buildings, a porticoed building with the remains of pillars, and a thesaurus (a sort of sacred "temple" where a collection of coins was found). The excavations show the continuity of life from the III century BC to the VI century AD. Cagliari's Roman heritage can be seen at the Roman amphitheater, built in the second century. Outdoor concerts are held in the amphitheater during summer. The University of Cagliari's Orto Botanico, or botanical garden, is one of Italy's top gardens and can be found at Via Sant'Ignazio da Laconi. It includes caves where ferns are grown, a collection of Mediterranean and tropical plants, and Carthaginian and Roman remains. Elmas airport, just outside the city, has flights from other parts of Italy and from some places in Europe. A bus connects the airport to Cagliari. The port serves ferries from Sicily and mainland Italy including the ports of Palermo, Trapani, Civitavecchia, and Naples. Ferries also go to Arbatax and Olbia on Sardinia. The train and bus stations are right in town. The rail line runs from Cagliari to Sassari or Olbia in the north. Local buses go to the coast and villages in Cagliari province while long distance buses connect the city to other parts of the island. Hotel Miramare is a 4-star boutique hotel on Via Roma, right in front of the sea. It is centrally located, art-filled and has a slightly bohemian vibe. T Hotel is a 4-star design hotel a little outside the city center, with amenities including a pool and spa. Hotel Regina Margherita is another 4-star hotel in the city center, offering modern rooms, a restaurant, and a bar. Hotel Italia is an older 3-star hotel in the Marina district of the city center, within walking distance of the train and bus stations. It also has a wine bar. La Peonia is a cozy bed and breakfast in a residential neighborhood connected by bus to the city center and Il Poeta beach. The climate is typical Mediterranean. Summers are hot and dry, though nights are often cooled by sea breezes. Winters can be quite chilly, with the most rainfall from October to February. Il Poetto Beach, about two kilometers from the center, is a long sandy beach and one of Sardinia's best beaches. Molentargius Marsh, east of the city, has many species of migratory and water birds including a huge colony of flamingos. Nora Archeological site, in a beautiful setting on the sea, has Phoenician, Punic, and Roman remains. There's a small Roman theater that's used for outdoor performances in summer. Su Nuraxi di Barumini, 60 kilometers north of Cagliari, is a UNESCO World Heritage Site and a great place to learn more about the nuraghi of Sardinia. The village around the nuraghe has been excavated and you can visit both the nuraghe and the village.